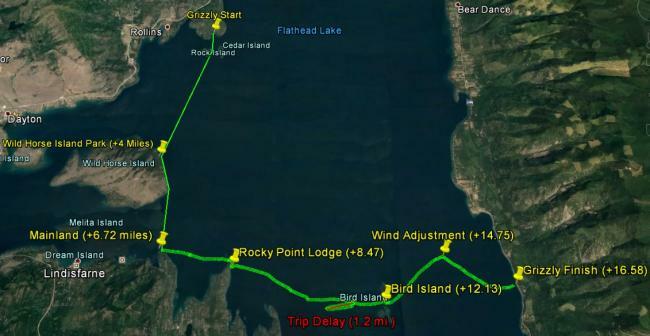 High fives to Sarah and Craig ( @ssthomas @uss_lenning ) for knocking off the first known lengthwise crossings of Flathead Lake, Montana yesterday! They did a 28-mile route from Somers to Polson. Very nice! Thanks for the post, and congratulations to the swimmers! i like to stop off here for a (much, much shorter) swim on my way to and from Glacier National Park, upper right-hand corner, though Garfield Bay on Lake Pend Oreille (swum last year by Elaine Howley) in Sandpoint, ID, is my favorite. The Inland Northwest is stuffed with relatively unknown treasures in the form of 10-mile and more lakes, and there is an active OW culture. Any of Glacier's lakes can be swum. One can also indulge in Flathead Lake cherries, and Montana huckleberries. Thanks for the post, Evan. It was 20 miles of fun, followed by 8 miles of pain for both Craig and me. Starting last week, we were watching the weather forecasts and the heat during the day was predicted to be over 95. So, we started at 3:45 am, to try and beat the heat of the day. In the end, the heat caught up to us and gave us a good pounding. Water temps started around 69 and I'll swear on my life there were spots of 80 degrees. We probably averaged around 71 degrees most of the morning and then up to about 75 degrees the rest of the way. Air temps were scorching- in the upper 90s. I have the swim cap line to prove it. In retrospect, we would have been happier starting at around 5 pm and swimming through the night. We were blessed with favorable wind most of the day, which can be a deciding factor in whether or not the swim is successful. I’ve heard stories of people getting stuck in 50 MPH winds out there. I finished in 13:39 and Craig was at 15:50. He was only about 200 yards behind at the halfway point, if that tells you how tough the heat got for him in the second half. This adventure was my idea, so I feel rotten about dragging an ice swimmer along with me and then watching him melt before my very eyes. Good thing Craig is forgiving! @vivebene: We went to Glacier the following day. I've got my eyes on a multi-day stage swim in the lakes there someday. They'd probably be closer to the temps Craig and I prefer than Flathead was! I'd love to know more about this and your contact info for the open water guy you recommend. Any blog posts about this amazing day? Nicely done! No blog post...I just posted pictures on Facebook. I do keep telling myself I should start a blog, but then never do. Oh, I did forget to mention. There are TONS of cherry orchards around. I'd also never heard of huckleberries before. But, we had some, so I feel like I got the true Montana experience. They sure are proud of their huckleberries. @ssthomas: Thanks for the discursive post on what surviving heck looks like from the water. It's been a disaster out there: wildfires in central WA, in Glacier's North Fork, and in Canada, with smoke and detritus billowing across the border into US. Already impressed with the achievement, I am even more so, hearing of the awful conditions. Bowman L in Glacier is my favorite. It's in the North Fork. Swim with grizz. It has a gentle cline from the campground area and a sandy bottom there. The rocks at the bottom of St. Mary L are covered with what I assume is glacial flour but looks like rock snot; the lake can get very rough very quickly. L McDonald is deep and allegedly has a drowned forest at the bottom (this seems to be true, but the forest was before the glaciers; it is not a recent forest that underwent some mystical burying). Surface temps around 60, 55 at toes if you hang. There don't seem to be any rules against swimming. @SydneD: Glacier is a national park in the West, and the treadway is the opposite of what one might find in New England Wilderness areas. Also, there are nice walks of longer or shorter duration that are relatively flat and wide. So a preference not to hike would not stand in the way of enjoying boat rides, waterfalls, glacier lilies, and other nice things about the park, such as going for a swim. More news coverage of this swim including a nice little slide show. This falls under small world I guess? 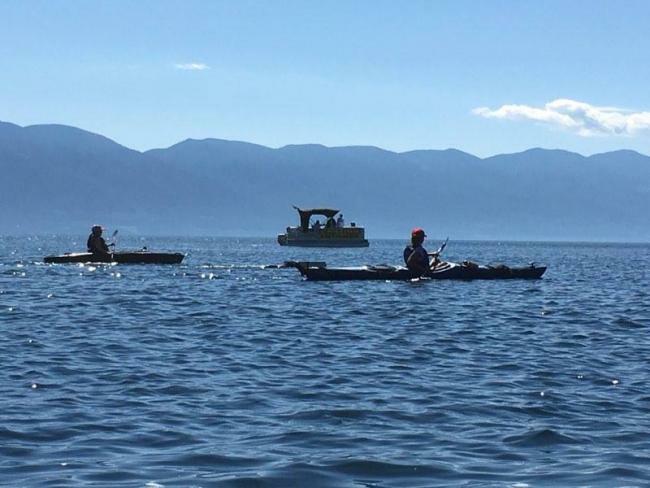 Former boss of mine (2010-2012) is vacationing on Flathead lake now and came across two kayakers escorting a swimmer named Heather, doing the Grizzly swim. One of the kayakers was named Mark Johnson (whose name I found here under a thread on 2015 nominations). Yes, I know Heather. She's a Colorado swimmer (like me and Craig). Mark used to live in Colorado, but moved to the Flathead area a few years ago. He's working really hard to grow the open water swimming community in that area. He swims there year-round (no wetsuit!) and is an awesome point of contact if you'd like to swim Flathead. He helped Heather on a nontraditional 15ish mile route in the lake. Mark is on here as @FlowSwimmers. Hey, @IronMike ! That's a great random photo, and thanks, @ssthomas , for the plug for open water swimming on Flathead Lake! I actually think I remember the couple who may have taken this picture...they were kayaking just near Shelter Island at the beginning of our journey. 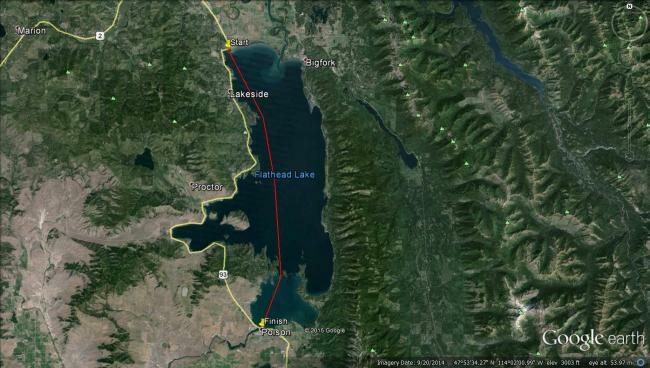 Heather just completed her "Chasing the Grizzly" swim on Tuesday. 15-miles, that turned into 16.5 miles due to a 15mph headwind that cropped up at hour 10! The Grizzly swim tracks the open water route of a 4-year-old female Grizzly Bear in 2010. Heather brought four friends with her to Montana this week for some swimming, Chasing the Grizzly, and other sight-seeing (like Glacier National Park). We've been playing on the river (rope swings, huge cliff jumps, etc. ), completing EPIC swims, and hiking in the island state parks out on the lake. It's beautiful up here. COME VISIT! Yep, that's them. Both redheads, man and woman (my boss and his wife). They are raving about how beautiful it is up there. A visit there is on my bucket list when I return to the states. Oh, and congrats to Heather! Tell her to come on here and tell us how her grizzly chase went! @1969Mermaid ... Heather, if you get the chance, can you tell about your "Chasing the Grizzly" swim? One year later... Thanks @evmo for the help on getting it "official." Congratulations all! What a beautiful swim! @ssthomas said: One year later... Thanks @evmo for the help on getting it "official." I only got the stuff in June! I am slow, but not that slow! Anyone else want to take a shot at this? Lake temp is currently in the mid-60s and the ideal swimming conditions should exist for another month or so. @evmo- I didn't mean to imply YOU were slow! I've been hanging onto the documentation since LAST July. You might not be slow, but I am! Craig put me in charge and I failed!